Wow, even the Corporate Media has picked up this story! 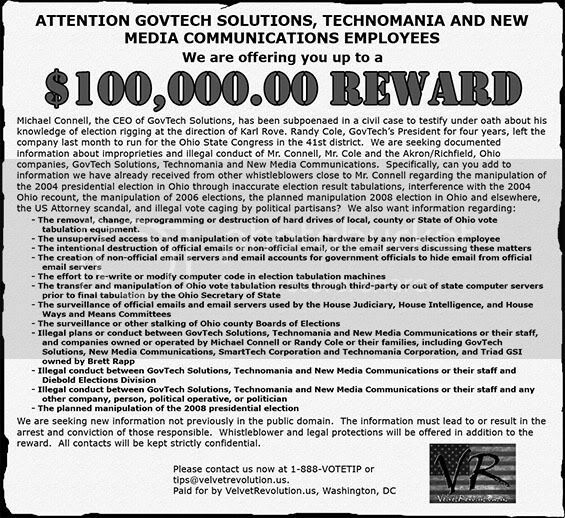 WASHINGTON, Oct 03, 2008 /PRNewswire-USNewswire via COMTEX/ -- Today, Velvet Revolution (VR), a non-profit dedicated to clean and accountable government, offered a $100,000 reward to whistleblowers for information tying Karl Rove and Michael Connell to illegal election manipulations. Other Republican whistleblowers, most notably world renowned computer expert Stephen Spoonamore, have stated recently that the Republican Party has been rigging elections for years through electronic computer manipulations. Mr. Spoonamore, a colleague of Mike Connell, gave a recent interview in which he stated that the upcoming election will be stolen and rigged by the GOP unless otherwise exposed. That interview is posted in full at www.rovecybergate.com. Mr. Connell is the CEO of GovTech Solutions, a company that works with a "Who's Who" of Republican politicians. Mr. Connell refuses "to work for Democrats" and is "loyal to the Bush family." And it was Mr. Connell who ran the Florida Government computer network during the presidential election of 2000 and the Ohio Secretary of State election computers during the presidential election of 2004. He has been at the scene of every major national electoral scandal of the past decade and has been fingered as being involved in the destruction of White House emails. Who is this Man behind the "Tech Curtain" -- Michael L. Connell ?? Rove-ing emails: what else could go missing? As reported here, the Bush family's personal Internet strategist installed proprietary database, email, and web servers on the U.S. House of Representatives IT networks, less than three months after President George W. Bush took office in 2001. Six years later, Michael L. Connell and his twin companies -- New Media Communications and Govtech Solutions -- have replicated that early success and spread throughout the federal government like one of New Media's award-winning viral marketing campaigns. should a top campaign consultant with a history of electoral fraud be a systems administrator for federal government IT networks? warns this respected Banking Security and Cyber Expert, Stephen Spoonamore. Security vulnerabilities in electronic voting machines threaten to skew results in the upcoming national election, says a Republican security expert. Stephen Spoonamore has come forward as a whistleblower willing to testify in an Ohio court case stemming from the 2004 Presidential elections. Spoonamore, former CEO of Cybrinth, specialist in data management and remote electronic monitoring, and card-carrying member of the GOP, explains in a series of YouTube videos how Diebold e-voting machines can be hacked and manipulated to change vote tallies. The videos were posted by Velvet Revolution, an activist group with the aim of exposing voter fraud and returning to paper ballets. The voting machines, according to Spoonamore, communicate with central government systems in the same way mobile phones connect with each other. The machine sends a signal to a tower, is filtered through third-party, corporate-owned computers identifying both sender and receiver, and then the votes-which are anonymous and without any type of paper trail-are then forwarded to the government receiver. The inherent problem is that third party wireless intercept of information. Spoonamore says without a doubt tabulations can be intercepted and changed before they are sent on to officials. More specifically, as was the case in Ohio in 2004, tabulations were funneled through servers in Chattanooga, TN, owned by SmarTech. Coincidentally, the Bush Administration has used these servers for sending and receiving email to avoid public scrutiny. Spoonamore, who has helped develop security solutions for MasterCard, American Express, Bloomberg, Boeing, NBC, News Corp., the Dept. 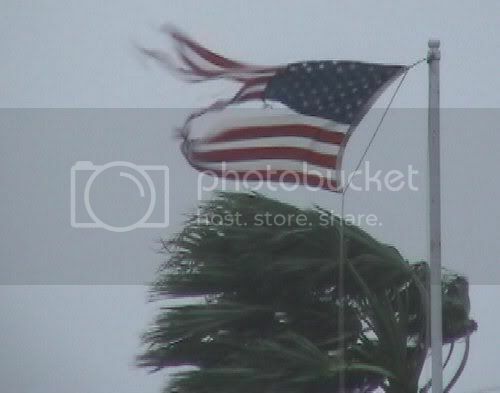 of Energy, the US Navy, and the Dept. of State, is on record, in a sworn affidavit, explaining how easily these voting machines can be hacked and manipulated. like New Media Communications, Govtech Solutions, SmarTech already ARE! have been "looking the other way", when it comes to Electronic Voting Machines, too? No need to worry -- you can Trust us! Note: Diebold -- is now Premier Election Systems"
That's sounds much more "trustworthy" ... it's all in the Marketing .. The only thing that HAS Changed, has been the Logo! with a verifiable Audit Trail! Peter King "We'll take care of the counting." of money for even an IT guy. Sure hope there are some disgruntled employees out there....or employees with a conscience(sp). I'd sure like to see some of Larry Flint's money added to the pot. on a few radar screens! 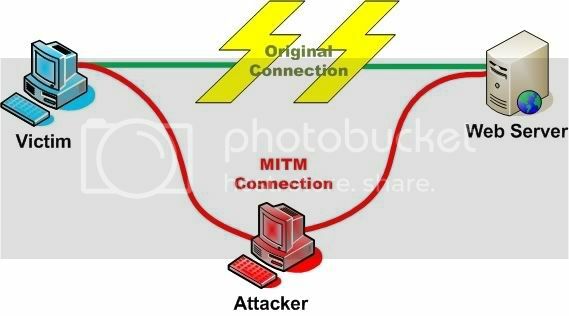 Is a great illustration for folks who don't get the significance of the reroute through the SmartTech Chattanooga servers. Hadn't seen the graphic before, thank you. Thanks for doing one that is so close to home jamess! It's a critical time and place for these people to be held to account, the reward is justified! I would contend, this "lack of an Audit Trail"
has given us these last 8 disastrous years! as a Fast Food Receipt! Our Country would have collapsed, long ago. perhaps we're in the process of that now? Sources close to the Ohio Corrupt Practices Act/RICO claim sent us a copy of the following letter that asks Attorney General Mukasey for protection for Michael Connell and his family who have been allegedly threatened by Karl Rove. Rove is believed to be the strategic mastermind behind the Bush 2004 re-election campaign and the possible Ohio election improprieties. he has a family, etc. Stephen Spoonamore was interviewed by Thom Hartmann a few days ago. Spoonamore characterized Mike Connell, a colleague, more as a "fall guy" than the Mastermind behind the MITM Attacks. Stephen Spoonamore, also insinuated that the Swift Boaters were the deep pockets, and the Right to Lifers provided the "ethical rationalizations". The Logistics of the theft consisted of "Network Funneling" (illegal) of ALL the Precinct Votes from 18 Ohio Counties to a SmarTech PC, JUST PRIOR to Re-Tallying those Results, and forwarding the "Final Counts" to Ken Blackwell, Ohio Secretary of State, and Chairman of ReElect Bush-Cheney. Getting anything important or substantative out there above the noise is getting harder and harder these days. But many hands are needed, as Avahome says! Maybe Mikey is a Loyal Bushie, after all? Along the way, Gahanna, Ohio's "loaves & fishes" vote count, showed 4,258 ballots for Bush in a precinct where just 638 people voted. This astonishing conflict of interest has been reported at the epluribusmedia.org on-line investigative service. Cross-postings have come from luaptifer at Dailykos and blogger Joseph Cannon's Cannonfire.blogspot.com. They all confirm that the RNC tech network's hosting firm is SMARTech.com, based in Chattanooga, Tennessee. 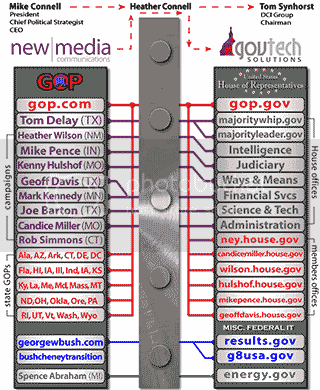 SMARTech hosts georgew.bush.com, mc.org and gop.com among other Republican web domains, in a bank basement. A matter of chance -- NOT! If the sampling were random and the Election were fair, one would expect those Green Bar Discrepancies to fall along the Bell Curve. all simultaneously indicate something was definitely wrong! 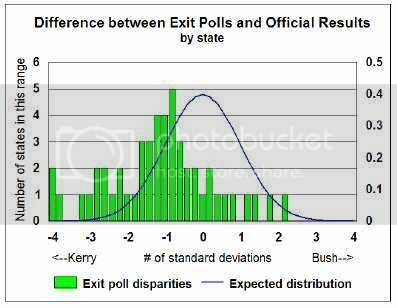 Statistical Experts would testify the Odds are Astronomical, against that much of a discrepancy between the Exit Polls and the Actual "final" Results, happening by chance only. Seven of fifty states have t values less than –2.7, meaning that each of their discrepancies had less than 1% probability of occurring by chance. The binomial probability that 7 of 50 should be so skewed is less than 1 in 10 million. in this election, when we see the realization of astronomical improbabilities play out. Those are pretty phenomenal. I've been trying to collect and update a set of links to relevant work related to this story in a table here. It's been my intent to organize it by date and to ensure all the contributions of OhioNewsBureau and the much larger body of other folks' work is included as well. For example, a new item adds some very substantial information (Will Mike Connell Avoid Testifying on Cyber Rigging?) including Connell's embedding inside the firewalls of the House Judiciary Commmittee and Department of Justice Internets while catering to Rep. Heather Wilson's new needs for email services and the White House needs for email destruction services in the midst of the US Attorneys purges and before that story broke. Then, the White House Internet director reported a comprehensive makeover of the WH site during that period the USAs scandal was breaking and as he was leaving the WH. David Almacy worked for DCI Group's TechCentralStation, GovTech Solutions, and Connell before he came to the WH. Lots of work to be done yet but this list and one at RoveCybergate.com, together, probably represent the two largest collections of such work. Once I get past my current task, maybe I'll attempt to do all of this but hey, don't forget that our Ohio work made it into a film reviewed by Roger Ebert, with a three-stars rating! Connell, Rove and the GOP Boys, Positioned for McCain? I've got some more digging to do! that are the key to all this.